Why? Because the Republicans may allow the end to a several years long program that gave nearly two years of extended federal unemployment benefits to people out of work. (HERE AND HERE). Yes, millions of people sit on sidelines because of Obamaconomy, but it’s the GOP’s fault they’re still there? That’s what the Democrats are selling and that exactly what Salon and Daily Beast are peddling. If these folks hadn’t fallen off the active employment rolls the unemployment rate would be 10% right now. These are not retirees, but people who could be working but for the horrible shape our economy is in and disincentives to business to hire. Obama has turned America into a part-time nation with 70% of new jobs being part-time due to his disastrous ObamaCare rules. 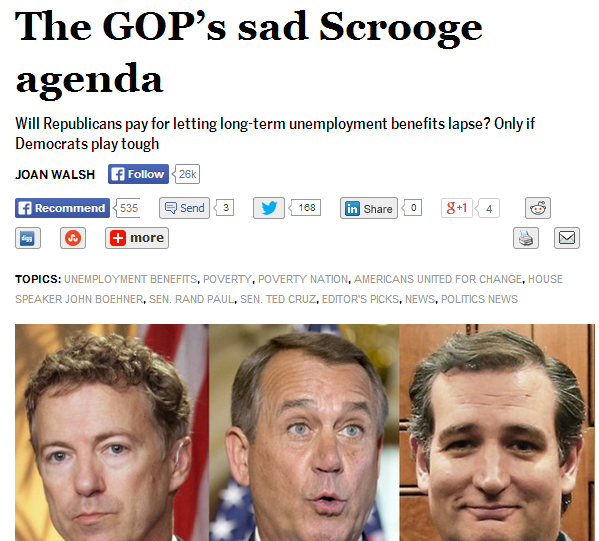 And the GOP are “SCROOGES” for not extending jobless bennies to nearly two years? That’s the sales pitch. The people who killed the economy, impoverished millions and have prevented millions from getting jobs because of their Dodd Frank, ObamaCare bills and various EPA job killing regulations–are going on the offensive in the 2014 midterm elections attacking the GOP for allowing the end to the already sunsetted jobless benefits. Americans United for Change, along with labor groups, plans an advertising and media push focused on vulnerable Republicans. Already, an effort to publicize the cost of cutting unemployment in those members’ home districts has paid off in remarkable local media coverage, as Greg Sargent laid out two weeks ago. How can you hope to sell the idea that the people who killed your job are not to blame for your troubles but the people who gave you record unemployment benefits are? The Americans United for Change has already gotten the Daily Beast, Washington Post and Salon to do their bidding. Can MSNBC, NBC, and the New York Times be far behind?